Thousands of rail passengers are being urged to reschedule their journeys after a power failure caused havoc on the East Coast mainline. 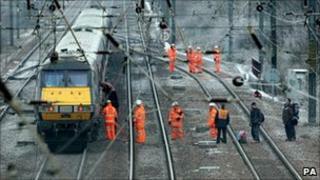 Trains between London's Kings Cross station and Peterborough ground to halt as an overhead line was brought down. Engineers heading to repair the problem at Huntingdon, Cambridgeshire, were hampered by icy roads. At one point, hundreds of passengers were stuck as eight trains were crippled by the failure. On one train, passengers were forced to clamber down ladders to get out of the carriage before being led back to the nearby station. A spokesman for East Coast advised travellers to re-schedule their journeys until Wednesday. Although trains were still leaving stations in Edinburgh, Newcastle and York, a spokesman for East Coast said services would stop at Peterborough. He added that all services would be subject to delays and cancellations. Passengers heading north from Kings Cross were advised to use alternative services from St Pancras, heading to Yorkshire, or on the West Coast mainline from Euston to Glasgow. East Coast managing director Karen Boswell said: "East Coast apologises for the inconvenience this will cause to passengers who are planning to travel today, due to severe damage to the overhead power lines at Huntingdon. "Network Rail staff are on site and are working fast to fix the problem but unfortunately we currently have no estimate as to when the line will reopen. "Our staff are working hard to get our passengers currently en route to their destinations as soon as possible with the minimum disruption." Susan Simmons, 54, a housewife from Newcastle, is stranded at Kings Cross with her daughter Andrea, 15, after a Christmas shopping trip in London. Mrs Simmons said: "Our train was supposed to depart at 10 but we got here to find it cancelled. "We were told to go to Euston so we went all the way there - but then we were told that train was full and the hotel at Euston was full. "British Transport Police sent us back to Kings Cross to get a coach - but there was no coach and now we're back to square one." Businessman Ron Berkley, 40, from Leeds, who was also stuck at Kings Cross, said: "It's a joke. We've got hundreds of people who've been here for hours and are still none the wiser about how we are going to get home. "You shell out so much for a ticket you expect a bit more when it all goes wrong." Travellers stuck on a train near Huntingdon were told they would have to clamber down ladders to get back to the station. Passenger Ian Dormer, who was heading to Huntingdon, said: "We've been told we'll have to use a ladder from the train on to the trackside in groups of 20. "We'll then be led down the track to the station." However, he praised rail staff - who have kept passengers' spirits up by handing out hot drinks and biscuits. A Network Rail spokesman said: "Services on the East Coast main line are significantly disrupted after overhead wires were brought down near Huntingdon station at around 0800 GMT. "Our engineers are on site and working to fix the problem. It is anticipated that there will be disruption on this line for the rest of the day. Passengers are advised to check with their train operator or with national rail enquiries." Wintry conditions are still wreaking havoc across England, affecting roads and halting many flights at Heathrow.